For my vacation, since I was not going out of town, I asked around as to where I should visit as a tourist in my own city, St. Louis. 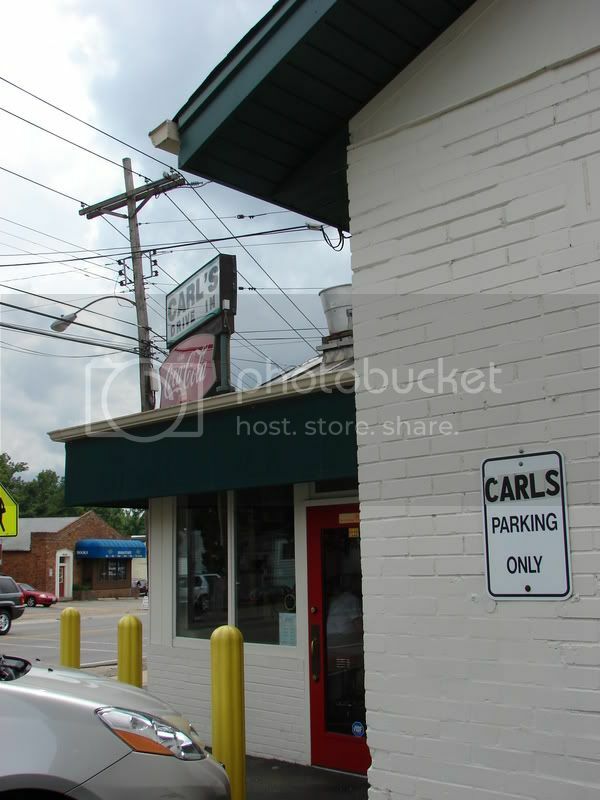 Several people told me I had to go to Crown Candy Kitchen and Carl's Drive-In. I've wanted to go to Crown for some time now, but I had never heard of Carl's (although once I got there I realized I had passed by it many many times...for shame!). I went to Carl's with my mom. Warned that it was crazy busy at lunchtime, we went a little later in the afternoon when it was down time. We saddled up to the small counter and placed our orders. 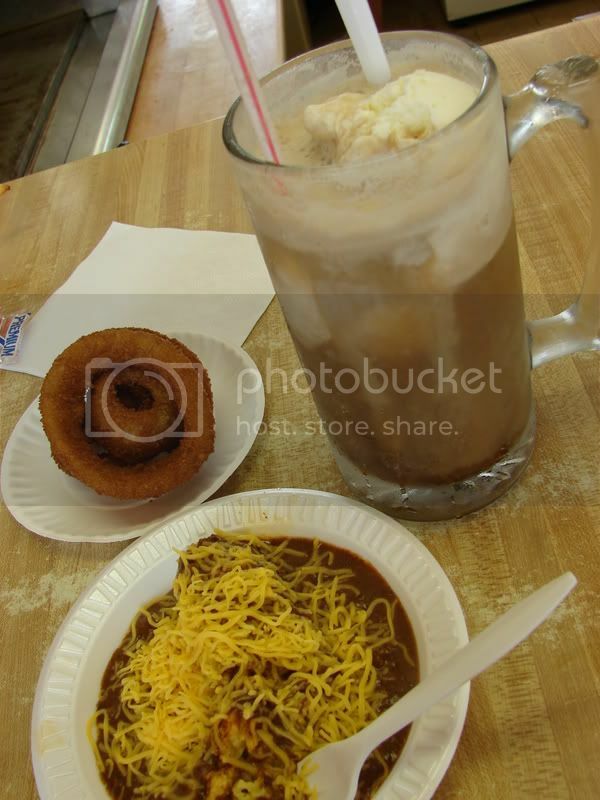 A cheeseburger, fries and small root beer float for my mom and a tamale, onion rings and large float for yours truly. The place is tiny. there's a counter with about 6 stools on one side, and the same on the other, each side only accessible by it's individual door from the outside. In the middle is where the magic happens. The cook prepares your food there right in front of you, while the waitress pours your root beer from the big barrel which is the center of the whole place. Did I mention that they make they're own root beer? Well they do. It's the original IBC recipe, and they make the syrup every morning. Awesome. 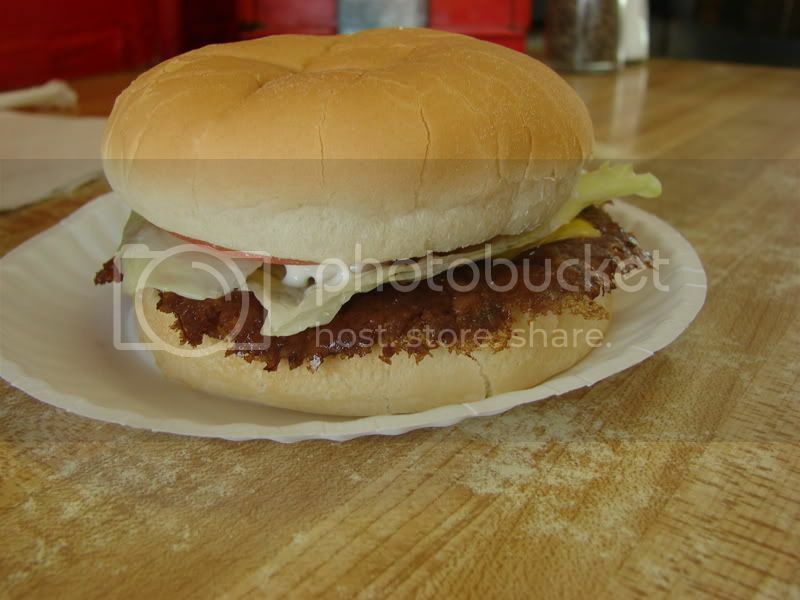 Here's my meal at Carl's. My favorite was the root beer float. I could drink that all day. The tamale was good, too. Everything was served on little paper or Styrofoam plates with plastic utensils. I don't think that's very environmentally friendly, but I don't think a place like Carl's worries about it too much. A close-up of my tamale. 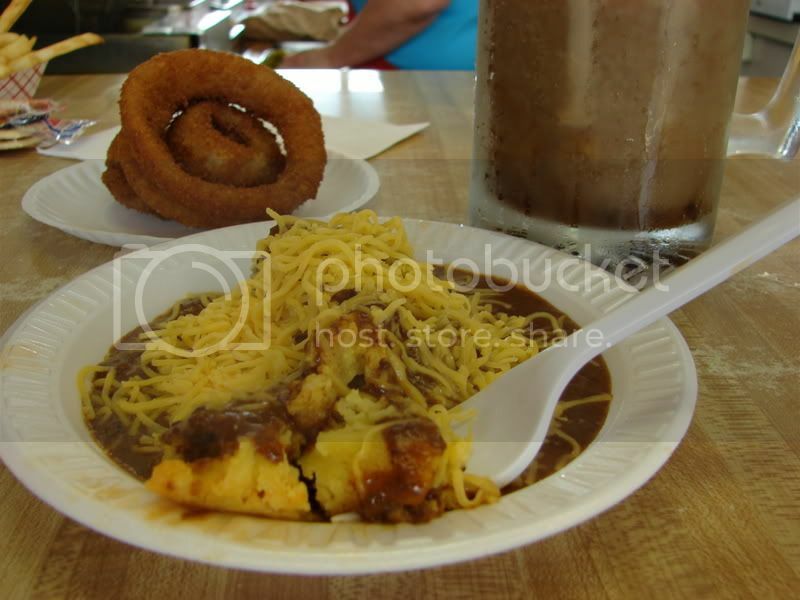 Chili, cheese, deliciousness. my mom's cheeseburger. She let me have a bite. So good. Notice the crispy edges. They really smoosh those patties on the hot griddle. My mom said she should have gotten a double. Next time. She also turned down my offer to get a Curly-Q dog to share. I'll have to get one next time...I asked the cook what exactly a Curly-Q dog is..."Deep-fried hot dog." Whoa. A couple days later, my aunt, cousin, grandma and I headed to Crown Candy Kitchen. Such a neat place. OLD. With great tin ceilings, dark, well-worn wooden floors, and small uncomfortable booths. 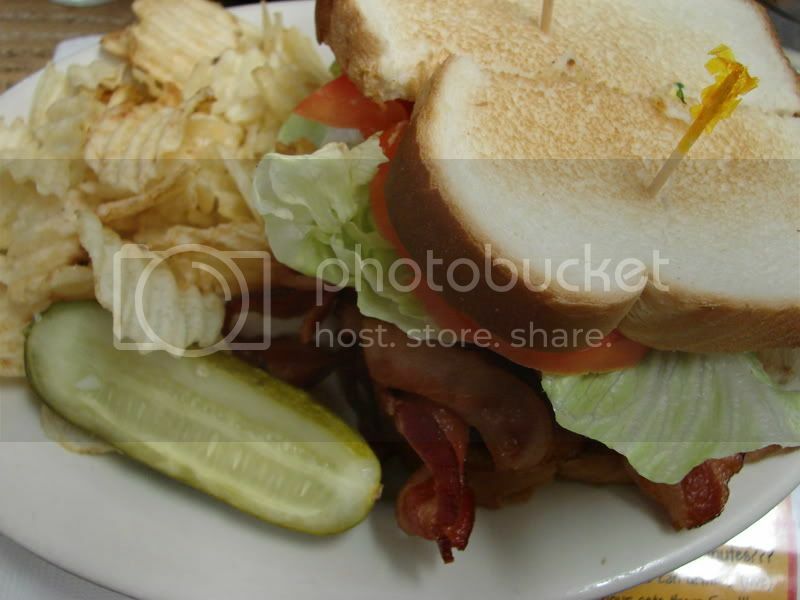 I was told I should get the BLT. So I did. 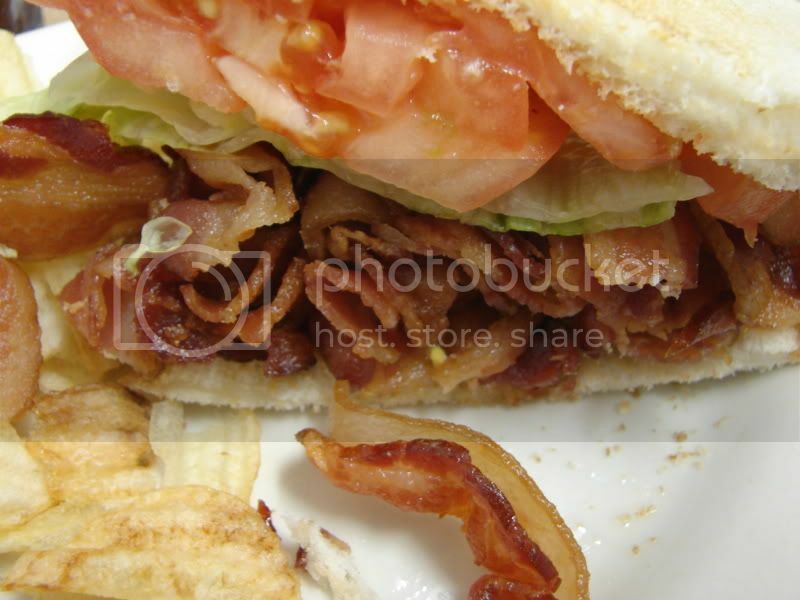 It was more like a BBBBBBBLT. So much Bacon! So much yumminess. Here's my meal at Crown. Seems simple, served with potato chips and a pickle half, but it was really tasty and made me feel warm and fuzzy. Perhaps it was the atmosphere of the old candy/ice cream shop, or the fact that I was enjoying this experience with some of my favorite people. Or perhaps it was all the BACON!! 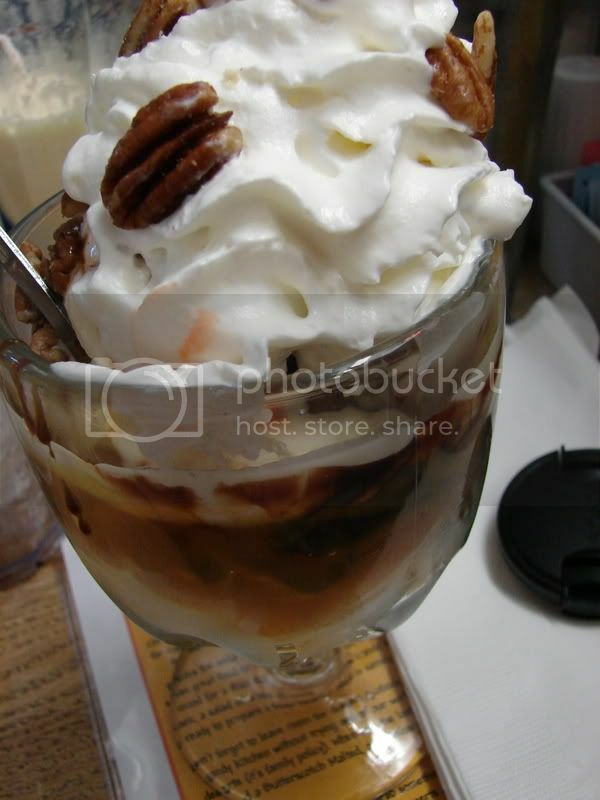 For desert I had the Crown Sundae, which has pretty much the best caramel and chocolate sauces you'll ever have. The chocolate, especially was soooo good...really rich and flavorful. On my way out of Crown, I got some of their famous candy, of course. Chocolate covered espresso beans, chocolate covered raisins and heavenly hash. They make the chocolate there, of course, and man, is it good chocolate. I wish I would have gotten more to last a little longer, but I guess I'll just have to visit more often. I can't believe I grew up here and had never been to either of these places! They are both like stepping into time-machines. Not cheesy theme-restaurant faked time machines. You can feel, taste and smell the history. And you can get some good eats at the same time. I highly recommend visitors and residents go to both of these places. I also recommend being a tourist in YOUR own city. Every place has somewhere that tells a great story. Very fun!! 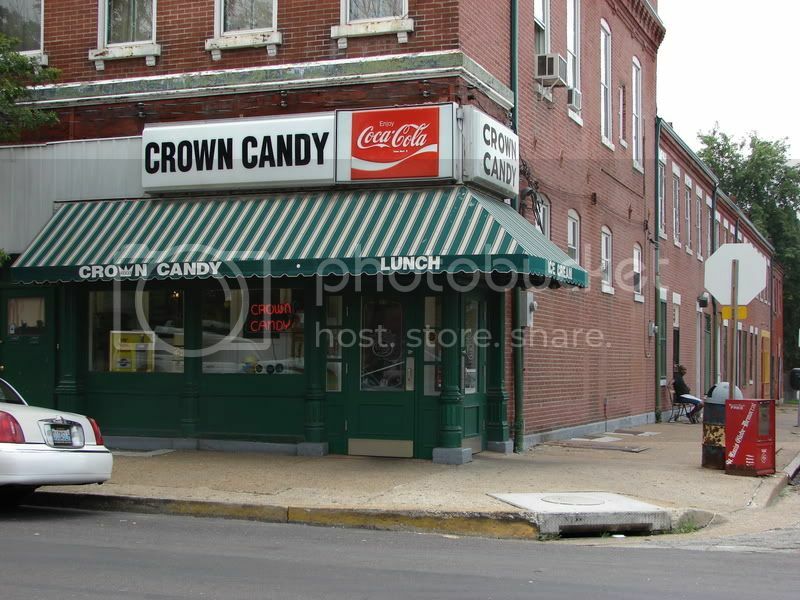 Crown Candy Kitchen is a regular stop, you must go back for a chocolate banana malt!!! I hope you have more stay-at-home vacations!